Henry Ford was an American industrialist and inventor who formulated the assembly-line methods for automobile manufacturing, which led to faster production at lower costs. One of the most popular figures in history, Ford inspired the Industrial Revolution in the United States and worldwide. Born on a farm in Greenfield Township, Michigan on 30 July in 1863, Henry Ford was the eldest son of six children born to William and Mary Ford. His father owned a prosperous farm. Henry was educated at the local one-room school for eight years where he demonstrated an early interest in mechanical objects. His father gave him a pocket watch when he was fifteen. Even at such a young age, Henry reassembled it and gained the reputation as a watch repairman. Spending his spare time in a small machine shop, Henry constructed his first steam engine in 1878. When his mother died in 1876, he refused to take over the family farm deciding that he did not want to be a farmer. Henry became an apprentice machinist in 1879, working in Detroit for three years. He then returned to the family farm in 1882 and worked for the Westinghouse Company as a steam engine repairman. In 1888 he married Clara Bryant, who had grown up on a nearby farm and they had one son Edsel, born in 1893. Ford returned to Detroit in 1891, taking a position as night engineer for the Edison Electric Illuminating Company. By 1896 he was their chief engineer. By this time Ford’s interest had turned to self-propelled vehicles and he built a “Quadricycle”, which comprised of a light metal buggy frame mounted on four bicycle wheels and was powered by a two-cylinder, four-horsepower gasoline engine. The fuel tank was under the seat and a tiller was used for steering. He sold the vehicle for $200 so enabling him to finance further projects. Ford and his partner, coal dealer Alexander Malcomson, founded the Ford Motor Company in 1903, and the company manufactured “practical automobiles”. 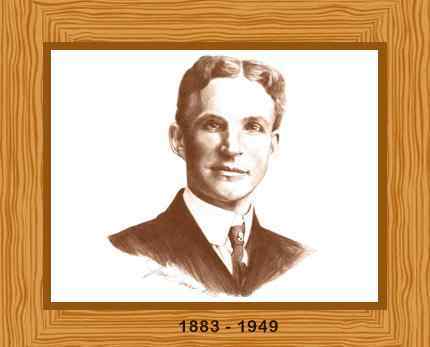 Ford was president of the company from 1906 to 1919, resuming this position from 1943 to 1945. He became the vice president of the Society of Automotive Engineers when it was established in 1905. The institute was formed to systematize automotive parts in the United States. In 1908, the company introduced its famous Model T vehicle, priced at just $825. Within months demand became so high that production could not keep up with demand. They appealed not only because of the price; they were also simple to drive and cheap and easy to repair. Ford changed the way automobiles were designed and built, bringing in the first assembly-line factories for the mass production of vehicles in 1913. This later led to lower prices, and therefore caused a storm in automobile ownership throughout the United States and abroad. By 1918 almost half of all American cars were Model T’s. A strong believer in a living wage, the Ford Motor Company announced a $5 per hour pay rate for its factory staff in 1914, more than double the going rate of other automobile companies. Later, in 1926 the working week was reduced from forty-eight to forty hours. By 1919 Henry and his son, Edsel had bought back the minority shareholders, and they became the sole owners of the company. Edsel Ford succeeded his father as President that year and remained in the role until his death from stomach cancer in 1943. Ford’s interests included auto racing and metallurgy. He owned a large holiday home and surrounding land in Richmond Hill, Georgia. He was also a controversial figure with strong opinions. His autobiography, “My Life and Work” written in conjunction with Samuel Crowther, was published in 1922. Henry Ford suffered a stroke and went into retirement in 1945. He was succeeded by his grandson, Henry Ford II. The American Petroleum Institute awarded him its first Gold Medal for outstanding contributions to the welfare of humanity the same year. Henry Ford died from of a cerebral hemorrhage two years later on 7 April in 1947. He was buried in the Ford Cemetery in Detroit. He was 83 years old.